Robersonville, NC – (July 11, 2014) Finally a Friday not plagued with rain and thunderstorms! Forecast models early on in the week looked pretty gloom as a large cell was working its way through the western part of Virginia & the Carolina’s! Luckily this system got here a little sooner than experts expected and assaulted the Hampton Roads and south-eastern Virginia region. 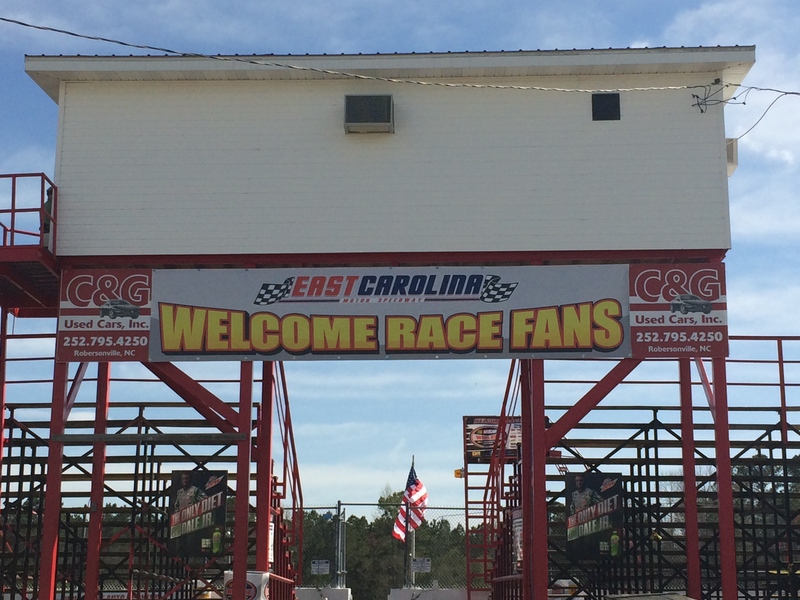 Friday morning conditions look favorable for a trip, so we packed up the car and headed toward the banked tri-oval of East Carolina Motor Speedway. On deck for the evening, make-up races and events from the past two events that were cancelled due to mother nature! The American Red Cross were on site for those who wished to donate blood, the Mini Stocks still had their 50 lap Mayhem race to run, and last but certainly not least it was Whelen Night, not to mention two pretty close battles for the points lead. Jeff Shiflett held a 12 point lead going into this race over Deac McCaskill, who practically dropped off the face of racing there for a bit. The other tight battle was in the Street Stock division as last weeks featured driver Jesse Council held just a two point lead over the #902 of Kevin Benton! The threat of rain clearly scared some of the drivers away as there were only a total of four UCARS and about six Street Stocks & Late Model Stocks. The Limited Late Models, who have seen a constant rise since the season opener, had thirteen cars take the green flag. A bunch of new cars and names we apart of the Mini Stock Mayhem race that turned out to be one heck of a finish! UCAR 25 Lap Feature here at East Carolina Motor Speedway with only four cars taking the green flag. However, the top three machines of Thomas Brandner, Duane Walker & David Wiggins make one heck of a race. Thomas Brander would hold on for the victory and keeps his spot on top of the points standings! Street Stocks were second up as six cars ended up taking the green flag! A great race early on between points leader Jesse Council, Kevin Benton, and Bill Price. Council would eventually run into some kind of mechanical issues after having at least a six car lead till about halfway through the race. Guess they always say cars are faster before they break. Benton & Price would battle for the lead the last few laps but it was Kevin Benton pulling into victory lane, and more than likely taking the points lead. Not sure if it’s the “almost” full moon, having almost a month off, or thirteen some Limited Late Model cars but this race was certainly trying on the nerves of many. Louis White made just about six pit stops, going almost a lap down, and needing to pull parts from his Late Model was able to use a record-setting eight cautions to his advantage to bring his H&L Logging machine to victory lane. “Had to pull parts from the other car, put em on this car, now we gotta go back and put em back again for the Late Model race.” Just goes to show what hard work from your crew will do. Rusty Daniels, Tyler Matthews, Chris Burns & Jerry Burns will round out your top five! Mini Stock Mayhem in town for their 50 feature and yet another just… I don’t even know what to say, a strange race! Cars were over heating, cars leaning and shoving each other. Smith & Clements decided to turn up the wick there at the end of the race as the two went door to door for the entire final lap. Clements tried to push Smith up the track off four, you know making his car real wide! Was not enough however has Smith won the drag race to the line! Smith and Clements renewed an age old rivalry while giving the fans one hell of a race, Kyle Barnes, Kristopher Hetu and Brian Bryant to round out your top five! Louis White pulling double duty tonight ended up finishing third, but not after a little altercation with Thomas Burbage. We caught up with White after that late model podium and he had this to say about his mix up with Burbage. “First off I want to apologize to Thomas, it was my fault all the way. My breaks are going out on the car, I ran it in there to deep and hit him.” White told the fans. “Thats why I let him go back ahead of me, I really wanted him to stay there, really sorry for knocking him out,” were the words from White before thanking his crew and all those who helped with both cars on the evening. VanWinkle, Burbabge and McNair would round out the rest of your field!